Among Bob Dylan’s many talents besides his widely-acclaimed, Nobel Prize-winning songwriting is doing interviews and, back in the 1960s when artists did them as a matter of course, holding press conferences. Dylan has always used the interview format as a means of personal expression in no less a creative and formalistic way than he does in his songwriting, poetry, books, painting, sculpture, acting, and filmmaking. 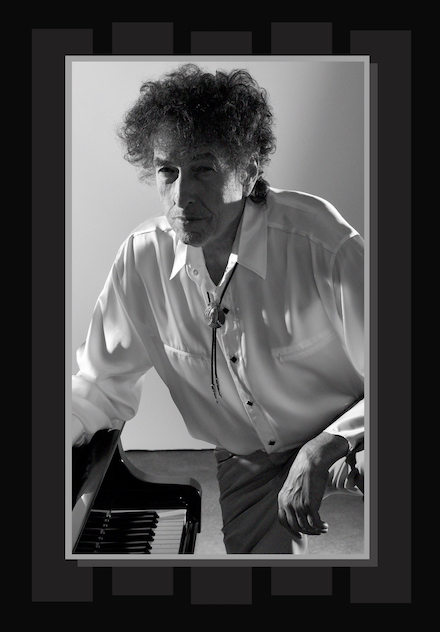 And in his newest Q&A, featured on the official Bob Dylan website, Dylan shows no signs of letting up. It’s a masterpiece of style, brilliance, humor, and phrasemaking. Slightly less arch than previous interviews – you really get the feeling Dylan is a lot less evasive than usual, a lot less tactical in his artful use of the dodge or the tall tale – Dylan comes across as remarkably present, thoughtful, and aware, and also as mischievous as ever. There’s enough of my personality written into the lyrics so that I could just focus on the melodies within the arrangements. I had some idea of where they stood, but I hadn’t realized how much of the essence of life is in them – the human condition, how perfectly the lyrics and melodies are intertwined, how relevant to everyday life they are, how non-materialistic. These songs are some of the most heartbreaking stuff ever put on record and I wanted to do them justice. Now that I have lived them and lived through them I understand them better. Modern music and songs are so institutionalized that you don’t realize it. These songs are cold and clear-sighted, there is a direct realism in them, faith in ordinary life just like in early rock and roll. I see … a very strange enchanted boy, a terribly sophisticated performer, got a cross section of music in him, already postmodern. That’s a different person than who I am now. My voice cracking here and there wouldn’t bother me, bum notes or wrong chords would bother me more. “You and me, pal, we got blue eyes, we’re from up there,” and he [Sinatra] pointed to the stars. “These other bums are from down here.” I remember thinking that he might be right. Songwriters have to have a reason to write songs, there has to be some purpose to performing it too. And sometimes it doesn’t connect. There is no magic formula to make that happen. Rock and roll was high energy, explosive and cut down. It was skeleton music, came out of the darkness and rode in on the atom bomb and the artists were star headed like mystical Gods. You start out wondering why you bought those blue pajamas and later you’re wondering why you were born. …. the melody in this song is kind of like the background in the Mona Lisa painting, a mystical, phantasmagorical fantasy land. Entire industries go, lifestyles change, corporations kill towns, new laws replace old ones, group interests triumph over individual ones, poor people themselves have become a commodity. Dylan: Real? Of course they’re real. I hope so. Once you get the idea, everything you see, read, taste or smell becomes an allusion to it. It’s the art of transforming things. You don’t really serve art, art serves you and it’s only an expression of life anyway; it’s not real life. It’s tricky, you have to have the right touch and integrity or you could end up with something stupid. I went into the woods with my uncle, my mother’s brother – he was an expert hunter and tried to teach me. But it wasn’t for me, I hated it. Is he, as is often suggested, the “jester” in Don McLean’s song “American Pie”? Don McLean, “American Pie,” what a song that is. A jester? Sure, the jester writes songs like “Masters of War,” “A Hard Rain’s a-Gonna Fall,” “It’s Alright, Ma” – some jester. I have to think he’s talking about somebody else. Ask him. I liked Amy Winehouse’s last record…. She was the last real individualist around. Heard any good records lately? Iggy Pop’s Après, that’s a good record. Imelda May, I like her. Valerie June…. BD: I Love Lucy, all the time, non-stop. BF: Why do fences come up between different styles of American music? BD: Because of the pressure to conform. This entry was posted on Friday, March 24th, 2017 at 1:05 pm	and is filed under Blog. You can follow any responses to this entry through the RSS 2.0 feed. You can leave a response, or trackback from your own site.